I became hooked on paleontology when I took an undergraduate course in the spring of 1974. Several of my friends and I enjoyed field collecting and began to spend as much time “on the rocks” as we spent in classrooms and study sessions. That love for field collecting continues to this day and has rubbed off onto my son (my main field buddy these days). 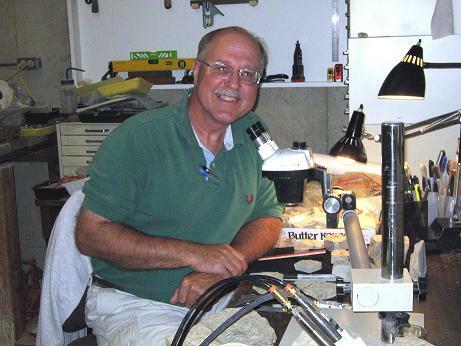 I began to specialize in the collecting of Trilobites during the 1980s and restricted it even further during the early 1990s by concentrating on North American Ordovician trilobites. To fend off the bill collector and put food on the table I had the opportunity to take my educational experiences in the upper Midwest and West Texas into the oil and gas industry for 10 years before the oil crash occurred forcing me back to school to flesh out my ground water education. Today I work in the water resources industry. The enjoyment that I find through collecting our favorite arthropod is not restricted to a single aspect but can be grouped around the following: 1) being out on the rocks – just as I discovered back in 1974 I continue to really like being in the field looking for specimens, taking note of the taphonomy, trying to deduce the environment of deposition and making sense of the sequence stratigraphy. 2) There’s nothing like the exhilaration that comes from finding that complete bug or part that may be new to the science or adds to the basic knowledge base. 3) The research that one can carry out whether on the rocks or in the library is rewarding for me and hopefully beneficial to the trilobite community. 4) Finally, that trilobite community is really a small group of us and whether we’re communicating through internet discussions or meeting at conferences and shows the unique group of individuals that comes together gives us opportunity to share our knowledge, our experiences, our collections and our comradeship. As the son of a geologist and fossil enthusiast, I seemed to be predestined to become an enthusiast as well. I found my first trilobite, a Paciphacops from the Haragan formation at White Mound in Oklahoma at the age of 3. As my years progressed I became more and more interested in trilobites, no doubt due to the influence of my father. However, it wasn't until the summer of 1996, at the age of 15, when I found my first Cybeloides iowensis that my interest became a fascination and practiced hobby. When I am not collecting fossils I administer a computer network for a company in West Salem, Wisconsin. We decided that with my knowledge of computers and fossils that we should create a website dedicated to trilobites from the Midwest in the hope that it may educate and perhaps even inspire others to take an interest in this unique and elusive bug.